There are races to run because everyone you know has run them and they become a shared and familiar experience. Then there are races to run because no one you know runs them which become slightly mysterious explorations. Such was the case when I signed up for the Marin County Half-Marathon, a smallish half-marathon run on the roads and trails in China Camp State Park just east of San Rafael held yesterday. A few people I know had heard about this race, but no one knew had actually run it. I hadn’t been to China Camp State Park in nearly eight years and hadn’t been on any of the trails there, so didn’t know much of what to expect. My fitness seemed pretty good. A couple of 4 mile tempo runs in the last month at 5:50-5:55 per mile pace range, 7-12 seconds faster than last fall, were encouraging. Plenty of 14 mile runs, with 15 and 16 mile runs thrown made the 13.1 mile half-marathon distances seem pretty manageable. Coming off a 1:25:57 in last November’s Monterey Half-Marathon, which corresponds to a 6:32 per mile pace, the plan was to go out in 6:25 mile pace for the Marin County race. Especially since the last six miles of the Marin County Half-Marathon covered moderately rugged trails through the State Park, including the dreaded “Hammer Hill” mentioned on the race website around mile 11. My wife and I drove the road part of the course the evening before to scout out the course ahead of time, but we had no idea what awaited us for the last six mile once we got off the roads and onto the trails for the second half of the race. So I kept telling myself, take it easy, keep the pace conservative at 6:25 in order to take on what the course was going to dish out on the trails. Of course, when the starting horn sounded, I blew out the first mile in 5:56. I did my best to ease off the throttle, trying to relax and take in all the great views of the San Francisco Bay off to my right. But I didn’t slow down much and came through first seven miles over rolling hills at 43:50, a little over 6:15 pace. At this point, I’m in fifth place, maybe 45 seconds behind the first female runner. The guys in front of me all look under 40 years old, so I figured at this point, I’m the top masters runner. That’s looking good if I can hold onto that, I’m thinking. At this point, the course changes dramatically from a rolling paved road to a trail through the woods. I look up and the first thing I see are switch backs ascending up a hill ahead and my legs are beginning to really feel those first seven miles. I work through the switchbacks and come through the uphill mile 8 at 7:46. I’m hanging in there but wishing I held back a little more at the beginning. The next mile is downhill, but rocks, ruts, and sharp turns force my gaze to the ground to find good footing. I come through mile 9 at 6:46 and look up to see glimpses of the top female runner ahead through the trees and underbrush. “Let’s try and catch her”, I say to myself. Then I get to mile 11 and there’s a sign saying “Start of Hammer Hill”. Hammer Hill is a series of three or four steep switch backs leading to a more gradual upgrade that lasts for another half mile. Not a killer hill, but at this point, I’m pretty fried. Getting over the top, it’s all down hill to the finish line along the San Francisco Bay shore at McNear’s Beach. I’ve got a good stride going and can see I’m reeling in the top female runner ahead of me, but it’s clear I’m not going to catch her by the time she gets to the finish line. The finish line clock says 1:26:03, but my Garmin watch says 1:26:59 and says “12.95 miles”, so it looks like the course is a little short. I maintained fifth place overall, and finished first in the male master’s division. Mission accomplished! I tend to over analyze things, so instead of kicking myself for going out a little too fast, I’ll just say this effort was clearly better than the Monterey Half-Marathon where I ran a 1:25:57 last November over a much less challenging course. And that race was definitely better than the Santa Cruz Half-Marathon I covered in 1:28:26 in April of 2013. So over the past year, it’s clear my training is going in the right direction. 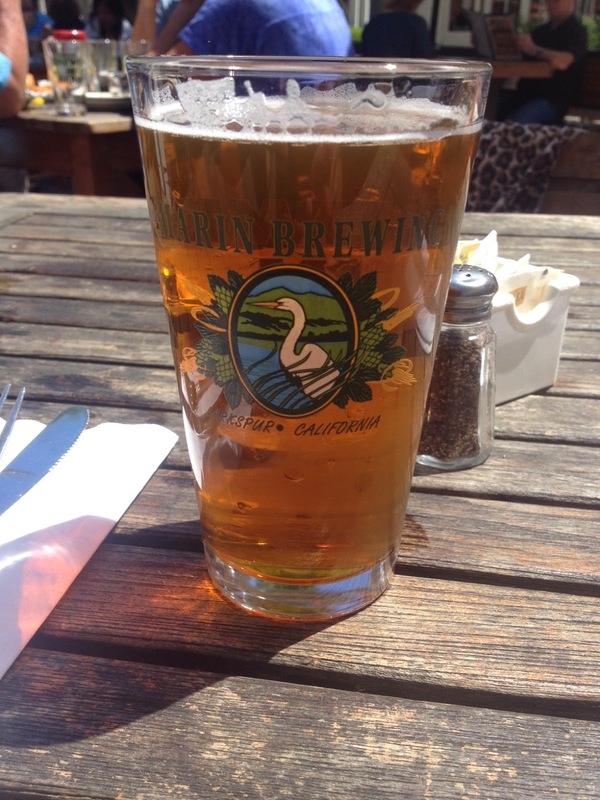 So with the Marin County Half-Marathon in the books, it was time to enjoy some post-race beers at Marin Brewing, rest up for a few days, and start getting ready for Bay to Breakers next month.